The Cypress Hotel: This hotel is famous; it’s hard to read any article on Carmel and not read about this one. But I think it’s lazy journalism and the fact that it is half owned by Doris Day who makes the place very dog friendly and not because of service, amenities or rooms. Now, for Carmel it’s one of the luxurious properties and the location is fabulous but don’t set really high expectations if you’re used to 4 star deluxe properties. The front staff is generally useless and the front office manager is scary (if you see her, you will know who I am talking about!). I have stayed here 4 times as the owners also owned my flat complex when I lived in Carmel. And when my flat was destroyed I was able to stay here (though I stayed here on my own before I moved). The rooms tend to be small but my favourites were the 1 bedroom suites that faced Lincoln street. It had a fireplace, a love updated washroom, a really nice sitting room and faced a courtyard on one end. It’s great if you have dogs because you can just open your door and you’re on the street. I stayed in a corner suite again with a fireplace and a massive amazing tub that I would recommend for a rendez vous. The downside is that it’s overpriced and loud – you’ll hear your neighbour, you’ll hear street traffic, you’ll hear the maids hoovering at 6AM. But the beds/linens are lovely and it’s a nice place to sit for coffee in the evening. But it’s always crowded which, if you want privacy, might not be for you. And if you don’t like dogs, do not stay here. L’auberge Carmel: Opened in 1929, this hotel has recently been redefined with old school elegance and charm with new school pricing. The location is hard to beat – it’s right in town, blocks from the beach and a block from the main drag, Ocean Avenue. With only 20 rooms, it’s very private and intimate with luxury details you’d expect to find in every room. It can sometimes feel a little too “done” and you’ll see a lot of suits from San Francisco here but there’s no denying that it is beautiful, architecturally stunning and cosy. La Playa Hotel: I haven’t stayed here but I would walk past it almost every day on my way to the beach. It looks like one of those old grand beach hotels and from walking the halls on the inside, seems to live up to it’s old world sophisticated appearance. It’s only a few short blocks from the beach and from any ocean view room you’ll certainly be able to hear the waves crashing upon shore. The cottages – which are set just off from the main hotel, look amazing, private and very Carmel. Post Ranch Inn: If you have money, stay here. It is undeniably one of the best hotels not just in the area, but ever. The details, the linens, the privacy, the luxury – it’s all here and understated which is something I love. It brings nature inside in a delicate, beautiful way that really makes you feel peaceful. The views are just some of the most amazing I’ve ever seen, especially from the infinity pool. This place spells romance with in-room massage to Prix Fixe dinners that allow to organically dine for hours. The hotel has even won several green lodging awards. The only downside if you can call it one, is that it is not in Carmel or in walking distance. But if you need a getaway, this is where to go. Drive into crowded Carmel instead! Bernardus Lodge: Located in Carmel Valley, this luxury hotel spells romance and quiet. Featherbeds, tubs for two, roaring fireplaces and a winery to boot, this place is worth the drive (it’s about 10 minutes to downtown Carmel). There’s also a spa which I haven’t been to but the menu looks amazing and eating here does too (the restaurant is always highly rated). Tree Bones Resort: What it lacks in luxury (no TV, phones, or private restroom) it makes up in views and simple pleasures (heated ocean-view pool, access to coast line, privacy and quiet). The rates are steep for something basic but this is Big Sur and nothing is ever really cheap. This is more luxury wilderness sleeping but it’s lovely. Carmel River Inn: Just off Highway one and not in walking distance to town, this is a great value property if you stay in the recently renovated Cottages. I really loved the one I stayed in as it has a gorgeous fireplace, the fluffiest, comfiest bed, a two person tub and a private garden which was great since I brought my dog, Jack. 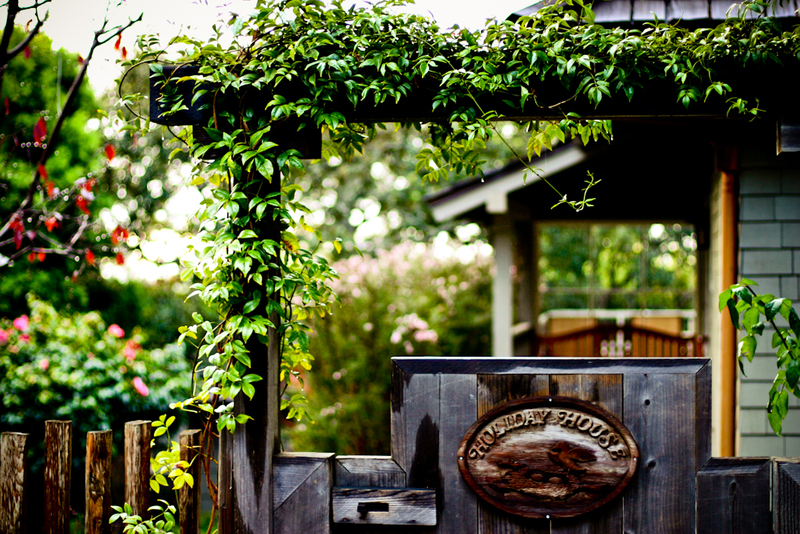 You’ll be nestled amongst trees and birds so you’ll have quiet and privacy and be reasonably close to downtown Carmel. The best parts? You don’t pay the usual area rates! Thanks SO much for putting this together, Alex!!! It is something I had asked for and, boy, do I love your post. Just what I needed! I agree with you about the Cypress Inn, you left out that you can hear the kitchen staff from the Lincoln St. Balcony! If you haven’t heard of the Lincoln Green Inn in Carmel, check it out. Absolutely perfect and dog friendly! Oooh I definitely want to try some of these out. Thanks for the list, Alex. I’ve stayed at the La Playa and it’s fabulous – I profiled it on my site as I’m always interested in historic houses/hotels. I love La Playa hotel and it’s grandness. We lived in Monterey for two and a half years, while my husband went to the Monterey Institute. While we were poor students at the time, we always longed to come back one day and stay there. We did indeed do it not to long ago. I loved the room, but the restaurant had something to be desired. I use to work in an art gallery in Carmel as well, called “Handworks.” It is long gone, and every time I go back for a visit, I miss the Carmel that once was. I’m just back from the Cypress Inn! I really enjoyed visiting there with my dog. I had to laugh about the description of the front desk service, it’s right on. I enjoyed the public spaces, the courtyard and the fireplace in the large lounge. My room was pretty small considering the price, but the location of the hotel was great. Thanks for this round-up!